The Smash Taunt characters are a group of characters that, as the name implies, appear in various Smash Taunts in Super Smash Bros. Melee, Super Smash Bros. Brawl and Super Smash Bros. for Nintendo 3DS / Wii U. 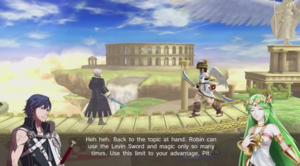 These conversations can only be activated in certain stages and by certain characters, which include Fox McCloud and Falco Lombardi in the Corneria and Venom stages, Fox, Falco, and Wolf O'Donnell in the Lylat Cruise stage, Solid Snake for the Shadow Moses Island stage and Pit in the Palutena's Temple stage. The following characters originally appeared in the Star Fox series. Fox, Falco, Peppy Hare, Slippy Toad, and Krystal are members of the Star Fox team, while Wolf, Panther Caroso, and Leon Powalski are members of the Star Wolf team. Peppy Hare is a former member of the Star Fox team. He is voiced by Chris Seavor in Melee, Dex Manley, who also voiced Falco and Panther in Brawl and Jaz Adams his voice actors from Star Fox 64 and Star Fox 64 3D in 3DS / Wii U. He appears in Super Smash Bros. Melee in the Corneria and Venom stages. He (along with Slippy, Falco, and Fox) will occasionally shoot energy bursts with his Arwing at the players on the stage. He also has a trophy in the game. Peppy also appears in Super Smash Bros. Brawl as part of the radio conversations that can be activated through Fox, Falco, or Wolf on the Lylat Cruise stage. He made another appearance in the Club Nintendo comic "Super Mario: Verloren in der Zeit", where he is shown watching the Olympics with Fox and Falco. Slippy Toad is a member of the Star Fox team. He is voiced by Chris Seavor in Melee, Mike McAuliffe, his respective voice actor from Star Fox Assault in Brawl and Lyssa Browne, his voice actress from Star Fox 64 and Star Fox 64 3D in 3DS / Wii U. He is the mechanic of the team, though he is able to pilot an Arwing. He is first seen in the Mario series in Super Smash Bros. Melee in the Corneria and the Venom stages. Slippy and his team will occasionally shoot energy bursts at the players on the arena. He also plays a role in the event match, Slippy's Invention. In this event match, Slippy has "invented" a Cloaking Device which makes Fox and Falco invisible. He later appears in How to Draw Nintendo's Greatest Heroes and Villains. In Super Smash Bros. Brawl, he returns as a guest character in not only Corneria but in Lylat Cruise, where he can be talked to through Fox's, Falco's, or Wolf's Smash Taunt. He also appears in the Nintendo Monopoly. In Shadow Moses Island, if he does a Codec Conversation on Falco, instead of one of Snake's team members giving a call, Slippy will come in by hacking the system. Krystal is a main member of the Star Fox team and is in a relationship with Fox. She is voiced by Alésia Glidewell, who also voices Zero Suit Samus in Brawl and 3DS / Wii U. She only appears in Super Smash Bros. Brawl in the Lylat Cruise stage. She, along with Fox, Slippy, Falco, Peppy, Wolf, Panther, and Leon, will occasionally shoot energy bursts from her Arwing on the stage and potentially hit one of the players. On Lylat Cruise only, it is possible to start a radio conversation with her while using either Fox, Falco, or Wolf. She also has a trophy in the game. Leon Powalski is a main member of the Star Wolf team and has a rivalry with Falco. He is voiced by Jim Walker, who also voiced Fox. He appears in Super Smash Bros. Brawl in the Lylat Cruise stage. He, along with the other Star Fox characters, will occasionally fire from his Arwing at the stage and possibly damage one of the fighers. On Lylat Cruise only, it is possible to start a radio conversation with him while using either Fox, Falco, or Wolf. He also has a trophy in the game. Panther Caroso is a main member of the Star Wolf team and is attracted to Krystal. He is voiced by Dex Manley, who also voiced Falco and Peppy. He only appears in Super Smash Bros. Brawl in the Lylat Cruise stage. He, along with the other Star Fox characters, will occasionally fire at Pleiades and potentially hit one of the fighters. On Lylat Cruise only, it is possible to start a radio conversation with him while using either Fox, Falco, or Wolf. He also has a trophy in the game. Pansā Karurosso Panther Caluroso. His last name means "hot" in Spanish and refers to his Spanish accent and the way he maintains his pink, as if he pretended to be a womanizer. ROB 64 appears during a conversation on the Orbital Gate Assault stage in Super Smash Bros. for Wii U / Nintendo 3DS. He appears after the first missile is destroyed to warn the Star Fox team of another approaching missile. The following characters originally appeared in the Metal Gear Solid series. Colonel Roy Campbell, Mei Ling, and Otacon communicate with Solid Snake and give him advice during his missions in the Metal Gear Solid series. Colonel Roy Campbell is a former member of FOXHOUND, and is also Solid Snake's commanding officer and close friend. He was introduced in Metal Gear 2: Solid Snake. He is voiced by Paul Eiding in English and the late Takeshi Aono in Japanese. In Super Smash Bros. Brawl, he informs Snake of his invitation to the Super Smash Bros. tournaments, and he analyzes some characters in the game, like Wario or Mario, giving tips to Snake about them. Otacon (real name: Dr. Hal Emmerich) is a recurring character from the Metal Gear Solid series. He is voiced by Christopher Randolph in English and Hideyuki Tanaka in Japanese. He is an American weapons designer and computer hacker, as well as an ally of Solid Snake. Otacon usually provides support by giving Snake advice via codec. He is also an otaku, which is why his nickname is "Otacon," named after the "Otaku Convention." In the game Super Smash Bros. Brawl, Otacon analyzes several fighters in the game, giving tips to Snake so he can battle them more effectively. This occurs in the stage Shadow Moses Island from the original Metal Gear Solid game. Like in the Metal Gear series, the Codec frequency to talk with Otacon in Super Smash Bros. Brawl is 141.12. Mei Ling is a character from the Metal Gear Solid series. She is voiced by Kim Mai Guest in English and Houko Kuwashima in Japanese. She is the one who invented Snake's wireless communication equipment, the Codec. After the player saves the game in Metal Gear Solid, she gives Snake advice by telling him Chinese proverbs and quotations by Western authors. The following characters originate from the Kid Icarus series. Viridi is the leader of the Forces of Nature in Kid Icarus: Uprising; while she starts as an antagonist in the game trying to destroy the human race and replenish nature, she later joins in the effort to defeat Hades. She generally engages in banter with Palutena and Pit while discussing the fighters. Hyden Walch voiced Viridi in Kid Icarus: Uprising, and reprises her role here, though she is not listed in the in-game credits. Chrom is one of the main protagonists of Fire Emblem Awakening. He only appears during Robin's conversation. 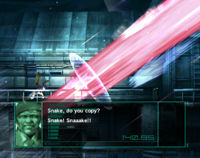 In Super Smash Bros. Brawl, radio conversations between the Metal Gear Solid characters can only be activated by Solid Snake in the Shadow Moses Island stage. 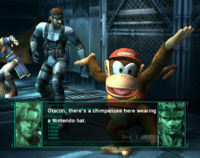 Otacon, Roy Campbell, and Mei Ling will communicate with Snake and give him background information and fighting skills on one of his opponents. In Super Smash Bros. Melee, radio conversations can only be done on Corneria and Venom and started by Fox and Falco. There are four different possible conversations for both characters. The conversation will include Slippy, Peppy, and either Falco or Fox, depending on who activated the conversation. In Super Smash Bros. Brawl, the conversations can only be done in Lylat Cruise. There are five different sections of Lylat Cruise: Corneria, asteroid field, skirmish, dogfight, and starry space. The taunt will change depending on which of these sections it is activated in, along with which character activates it (either Fox, Falco, or Wolf). The conversation can include Slippy, Peppy, Krystal, Panther, Leon, and either Fox, Falco, or Wolf, depending on who activated the conversation. All of the conversations from Super Smash Bros. Melee can be triggered on the Corneria stage, and will even keep the same voices and sprites. Slippy: Use the B button and the Control Stick combos for special moves! Peppy: Press Up, X, or Y to jump! Falco: What? You're just now explaining the controls?! Slippy: Wow! I almost feel like going for a swim! Falco: You swim in the ocean too? Slippy: Don't make fun of me, birdbrain! Peppy: Fox! Be careful! I have a bad feeling about this. Slippy: What? Everything's fine - I'm here! Falco: Behind you, Fox! Stay alert! Peppy: Just don't give up! Trust your senses. Peppy: Look, we're passing Corneria. Protecting this planet sure has been a lot of work. Falco: Yeah, it's kept things from getting too boring around here. Wolf: Don't think you can take a breather just yet, Team Star Fox! Wolf: You know you are all like us. Our fates are intertwined. We are destined to meet in battle. After all, what fun is there to be had in peace and quiet? A true warrior can only live in the battlefield! Falco: Then why don't you show me what a real warrior's like, fuzzball! I'm ready if you are! Slippy: Boy those guys are always itching to fight, huh? Peppy: We've hit an asteroid field! Protect the main ship at all costs! Falco: Take it easy, Peppy. We just need to blow up some of these asteroids, right? Slippy: Don't worry about us, Fox! We've got things covered here. You just focus on the battle! Krystal: Don't let us down, Fox! Slippy: Blast 'em once for me, buddy! Peppy: We're in the middle of an interplanetary skirmish. Stay sharp and keep an eye on your six! Slippy: Eeep! This place is a war zone! Falco: Heh, what are you worried about? These guys are weaker than overcooked noodles! Peppy: Mmm? Overcooked noodles? What's that supposed to mean? Krystal: That's not a terribly good comparison, is it? Falco: Pff! We meet again, Star Wolf! Krystal: Uugh! These guys are no joke! Leon: Heh, I'll make sure to work you over real good before I turn you into scrap metal. Panther: Do you see my red rose? It marks your imminent death! Wolf: Listen close: I won't let a single one of you leave here alive! And Fox, remember this! I'm the one who's going to take you down! Falco: Fox looks like he's got his hands full. Krystal: Yes, he's putting up quite a fight, though. Peppy: You know, he reminds me of his father every day. Slippy: Hey, this is no time for chitchat guys! Shouldn't we be worried about Fox? He's out there with no air! How's he supposed to breathe?! Peppy: Bah! Way to go, Slippy. No one would've even noticed if you hadn't opened up your big yap! Peppy: Look out, Slippy! Enemies behind you! Slippy: Fox! I think someone's on my tail! Fox: Get out of there, Slippy! Slippy: Thanks, Fox! I thought I was done for! Peppy: Falco! Don't let them get you! Slippy: This has gotten interesting! I'm on the edge of my seat! Fox: Calm down! This is where the real battle begins! Slippy: Hold the A button to charge up shots! Peppy: Cut your way through with a boost! Fox: Aren't you guys thinking of something else? Fox: All ships report in! Slippy: This is Slippy! I'm all right! I'm all right! Peppy: Peppy here! I'm a little shaken, but I'm OK. Sorry... I've always wanted to say that. Fox: Looks like we made it to Corneria. Falco sure is a sticking it to 'em out there. Krystal: Yes, but don't you find it... odd? I've never even seen some of his opponents before. Fox: Well it is a brawl, after all. Everyone's in on the fight! Peppy: That gives me itching for some action. I want in! Slippy: No way! Old-timers like you ride the bench. This fight's mine! Krystal: What are you two thinking? I'm the only one who can come through in a fight like this! Fox: It's an asteroid belt. We've got to clear a path! Slippy: EEEP! OH, THIS IS BAAAD! Peppy: Get ahold of yourself, Slippy! Falco's counting on us. Krystal: If we let a fragment fly off toward the ship, it could cause serious damage! Slippy: I wouldn't worry too much. Falco's a tough old bird. He can take care of himself. Peppy: Well... yeah, I guess you've got a point there. Slippy: Wow! We're in the middle of a full-scale skirmish! Fox: Keep your hat on, Slippy! Peppy: Yeah, look at Falco. He's not letting the skirmish slow him up one bit. Krystal: Yes, he's the fighter, all right. Who else would have the guts to open a communication channel during a fistfight? Peppy: Just the same, watch yourself, Falco. Don't go getting yourself toasted by a stray laser! Wolf: Playtime ends here, Star Fox! Leon: Hey there, boy, how do you like my new ship? Want to see what it can do? Panther: I am known as Panther Caroso. I salute you, my enemy. Krystal: Hmph, it looks like the gang's all here. Peppy: Good enough! Come on, Fox, let's get 'em! Slippy: Hey, don't forget about me! Fox: Ah, finally a day free of space combat. Krystal: That may be so, but it's looking like a regular war zone on top of the ship. Peppy: Falco! If you lose this one, I'm never going to let you live it down! Go, Falco! Never give up! Trust your instincts! Slippy: Ha! I think I've heard that line before! Peppy: Erm, sorry, Fox. I kind of channeled your dad there. Fox: Yeah, I noticed, Peppy. Leon: A blue planet... It's actually quite breathtaking, isn't it? Slippy: Boy, I'll say! Look at all that water! It's a paradise for guys like you and me, huh? Without a quick dip in the water now and then, we get all dried out! Leon: Listen, I'm no frog. Don't try to stick us in the same group! Slippy: But, you've got a long stretchy tongue just like me, right? Leon: Didn't I just tell you to drop the subject? Leon: Star Wolf is here in the asteroid field. Krystal: Oh my. This looks like it's going to be rather nasty. Panther: Worry not, my dear. Should you find yourself in harm's way, I would use the very ship I pilot to protect you. Krystal: Oh, I feel so much better hearing that. You're such a gentleman, Panther. Falco: Do me a favor and get creamed by an asteroid while you're at it! I'll sleep better at night once you do. Panther: Cease your jabbering, parrot! Falco: What did you just say?! Panther: A skirmish... Just the place for a bunch of space drifters like ourselves. Leon: Star Wolf is really giving it his all out there. I'm more than a bit envious of him. Those razor-sharp claws. Those keen fangs. He moves wildly and fights with the spirit of a warrior possessed. Any prey he sets his eye on is doomed to be shredded to pieces. Panther: Umm... Leon? Are you feeling all right? Panther: Set me straight here Leon. Are you envious of the shred-DER or the shred-DEE? Panther: You're foolish to anger me, bird. You must have a death wish! Falco: Feh! You guys just won't learn your lesson, will you? Leon: Impudent fowl! You will kneel before me! Slippy: Ahhh! Guys, Falco's in trouble! Falco: Can it, Slippy! The tougher the scrape, the brighter I shine! Keep back! I'll be the one to bag this cat! Krystal: My, the stars out here are so beautiful. Panther: Oh, but not as beautiful as your radiant self, my dear Krystal. Krystal: Oh Panther, you always were quite the flatterer. Palutena's Guidance can be triggered with Pit exclusively on the Palutena's Template stage. When used, Pit will engage in conversation with Palutena and Viridi about the character Pit is facing, though other characters appear for a few conversations, and are based upon the conversations that occur in Kid Icarus: Uprising. While the conversations are mostly based around humor as they are in the original game, they also provide some information on each fighter. SNES Star Fox A member of the original Star Fox team. Peppy Hare was an esteemed pilot, now retired and currently commanding the Star Fox team from the mother ship, the Great Fox. Although he's known for a propensity for nagging, the praise and trust his team gives him hasn't changed throughout the years. SNES Star Fox A top-notch mechanic with less-than-stellar battle skills. Respected for his talent, he joins the Star Fox team and shows his mechanical genius in everything from vehicle maintenance to weapons development. Slippy often holds the team back with his clumsiness but makes up for it with his likeable personality and morale-boosting presence. GCN Star Fox Adventures A member of the Star Fox team welcomed in Star Fox Adventures after the team met her on planet Sauria when responding to a distress signal. Krystal is capable of telepathy and is a valuable member in combat. After becoming romantically involved with Fox, their relationship gets very rocky in Star Fox Command. GCN Star Fox Assault The newest member of the Star Wolf team, rivals of Team Star Fox. A show-off who often embarrasses his teammates, he considers himself quite the ladies' cat and can hardly contain himself from making passes at attractive females, including Krystal, who he's clearly smitten with. Panther's trademark is a red rose. All things said, he's still a highly skilled pilot. N64 Star Fox 64 A member of the Star Wolf team and a cold-blooded assassin. Without an inkling of goodwill or moral standing, Leon carries out duties as required by the job, remaining indifferent and robotic throughout. On top of his lethal skills, he maintains a solid reputation as a skilled pilot. Leon has been a teammate of Wolf's ever since belonging to the Venom army. This page was last edited on October 13, 2018, at 23:03.